Here's wishing all of you a Happy New Year! May we face 2015 with courage and integrity! 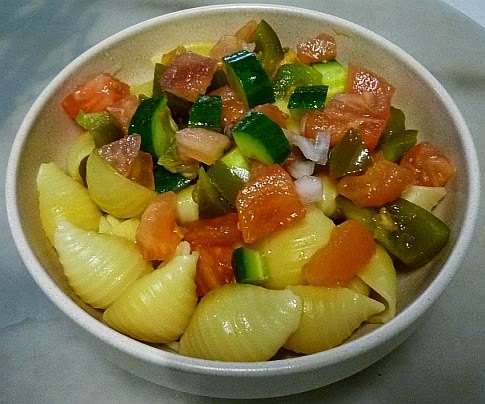 Pasta prepared at home - Conchiglie, Tomatoes, Cucumbers, Capsicums. Looks so good and healthy.. Mine? Had taichau dinner last night.. Happy new year to you & family.. So you do cook! Happy New Year! 10 years ago I cooked. Not anymore. Happy New Year to you and your partner! Looks very nice and good. Happy cooking and Happy New Year to you. Very healthy bowl of pasta! It really is. Just need some protein though. home-cooked meal on new year! yummzzz!